While for many 5G remains a distant dream, it will be ready for select markets as soon as next year. One of the world’s leading chipset makers, Qualcomm has just unveiled their new antenna module which will enable the high-speed swath of networking spectrum to work with mobile phones. As announced in an official blog post, Qualcomm’s new QTM052 mmWave antenna modules will give users a big boost in speed with lower-bandwidth 5G solutions, but the truly impressive parts are the changes towards the mmWave network. While the mmWave portion of the spectrum offers dramatically faster speeds, it also transmits at a much shorter range and is far more easily blocked by things like walls and even users’ hands held over their devices. According to Qualcomm, this can be solved with the help of its QTM052 antenna. 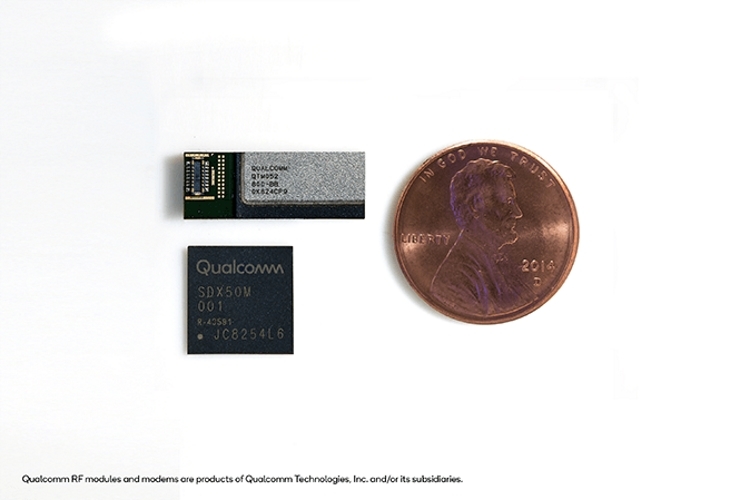 It’s a tiny antenna array, roughly the size of a penny, that features four antennas that can (with the help of Qualcomm’s algorithms) accurately point toward the nearest 5G tower. It can even bounce signals off of surrounding surfaces. The QTM052 is designed to be small enough that device manufacturers will be able to embed it into the bezel of a phone. Qualcomm says that the first devices with the QTM052 antennas should be launching as early as the beginning of 2019. Hopefully, we’d have some working 5G networks by that time to actually test out the fast network speeds.